John Deere Gator "The Impulse" stereo system. Don?t want to pay an over the top price for a factory stereo? 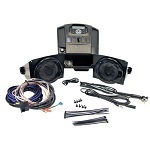 Have your own great stereo for your ride with this Dash-Mounted Stereo Kit. Install is easy! Play your music from almost any source!